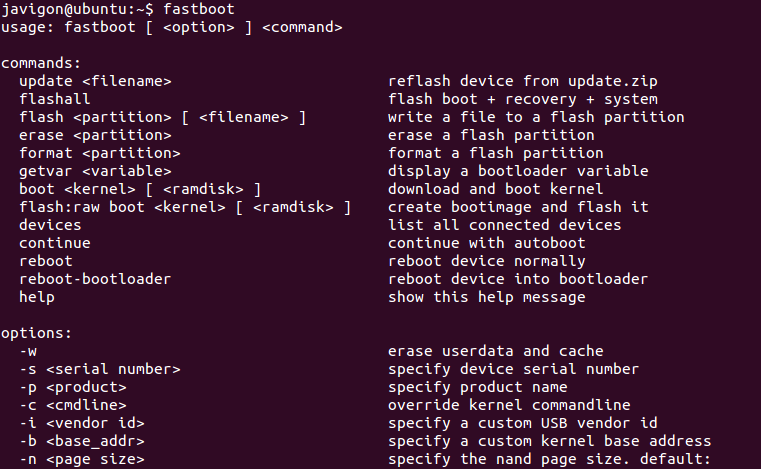 As fastboot will allow us to flash a device using a USB interface, we need both -the host machine and the device to be flashed- to be aware that we are using the fastboot protocol. For this, we need to enable the protocol in the device itself so that commands arriving from the USB port in the host machine are accepted. Fastboot, as we can imagine, given its nature of “flashing protocol”, does not require a OS to run on the device, but it does need at least, a basic shell to run on top of – just like the one provided in a common boot loader such us u-boot. (Please follow this link to read more about The Bootloader). 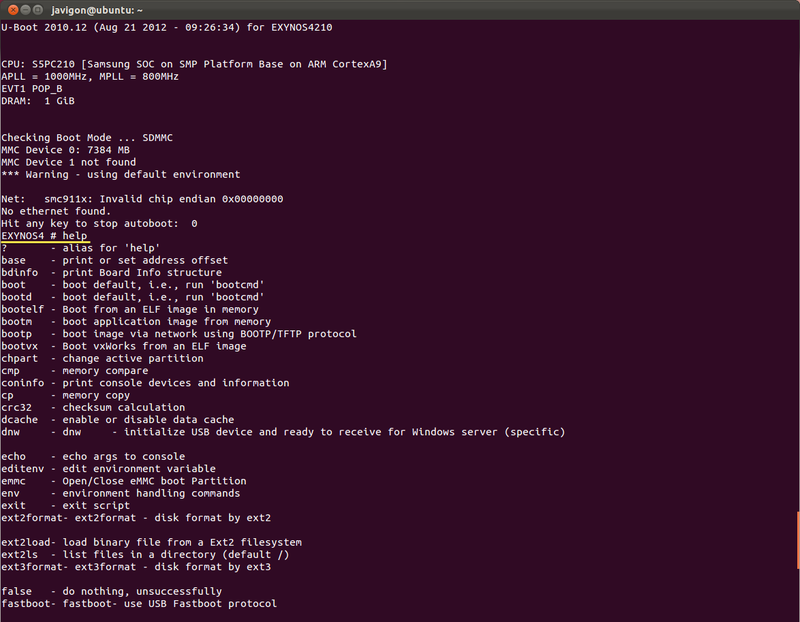 In order to access this shell, power on your device and press any key before the kernel is loaded (around 5 seconds). You will get a console that looks like the one in the picture below. Type help in order to see which commands are available. Now, you should insert your OTG cable (mine is MicroUSB(male) – USB(male) ) and connect it to your host machine. You should see that when you plug the cable in, you get a “OTG cable Connected!” in your serial terminal. This means that now the device is waiting to get commands over the USB port. The board should restart and successfully complete the boot sequence, allowing us to handle the device as any other Android device we have used before. Also, it allow us to play with some more advance features such as modify base address for the kernel (fastboot -b <base_address>) or the page size (fastboot -n <page_size>). 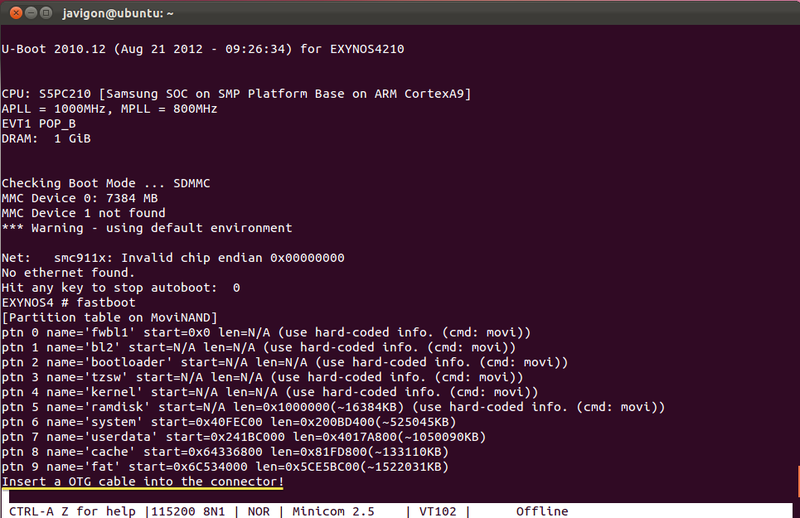 This entry was posted in Development Tools, Embedded Systems and tagged Android, Commands, Fastboot, Flash Device, Tools. Bookmark the permalink.